Heat oven to 350. In a saucepan, cook butter, whipping cream and brown sugar over low heat, stirring often until butter is melted. Pour into a 13x9 greased pan. Top with sliced apples. In a large bowl, beat cake mix, water, oil, eggs and apple pie spice on low speed until moistened. Beat on medium speed for 2 minutes. Carefully spoon batter over apple mixture. Bake for 40-45 minutes or until toothpick inserted near center comes out clean. Cool in pan for 10 minutes. Loosen sides of cake from pan and place a cookie sheet over the pan. Then flip in over. Let the pan remain over the cake for about a minute so caramel can drizzle over the cake. Remove the pan. 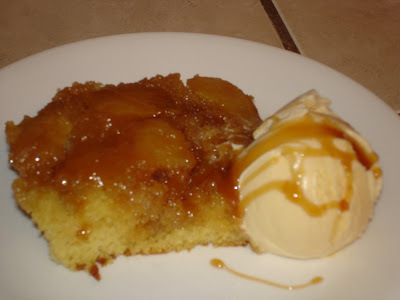 Serve with vanilla ice cream and caramel topping. I got this recipe in my 2010 Betty Crocker Calander. It looked soooo yummy, so I just had to try it. We all loved it. Even my husband who is not a fan of cooked apples.